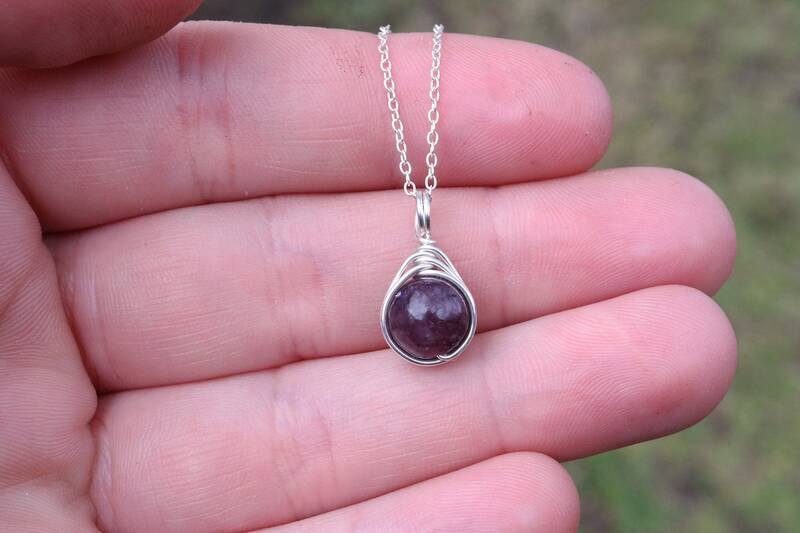 Lepidolite gemstone necklace, wire wrapped with sterling silver wire. This stone is natural so varies in colour, inclusions and size. The one you receive will be similar to the one in the photos. 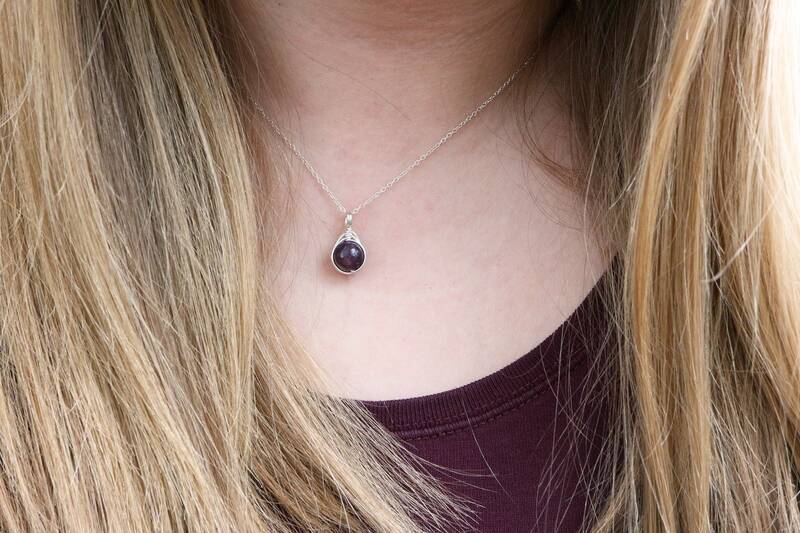 The bead is approx 7-8mm, and comes on an 18inch sterling silver chain, as shown in the photos. If you are unsure of sizes please check against a ruler! Lepidolite is variety of mica. It is stone of calm, trust, and acceptance. It has a strong relaxing, balancing and calming effect. It brings hope in dark times by lending a sense of balance and calm. 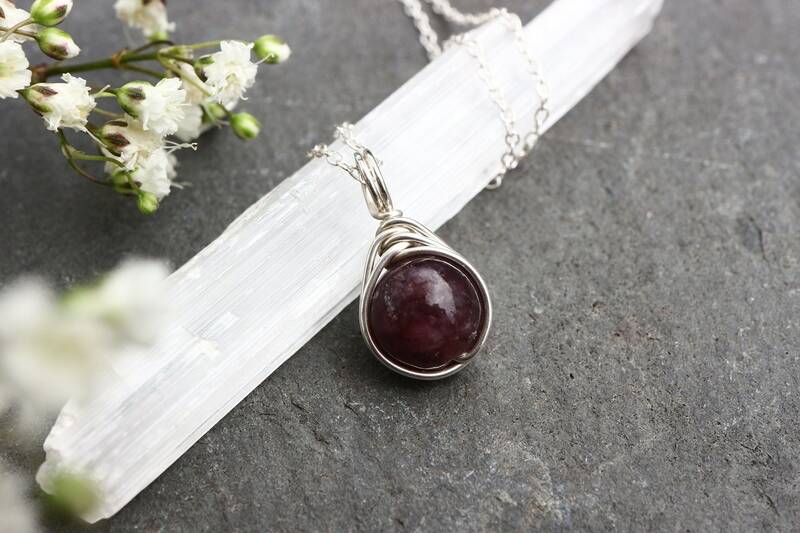 Lepidolite is a stone of transformation in that it helps one get through transitions with trust that everything will ultimately turn out for the best. It engenders and enhances self-love, patience, and optimism. Lepidolite is also a protective stone that brings success in business or career. It can also bring a growing energy to gardening and agriculture. Emotionally, lepidolite is one of the best healers I know. It decreases stress, anxiety, depression, manic-depression, despondency, PTSD, anger, and other traumas, panic attacks, and addictions. It brings gentleness and balanced energy to all these and other emotional issues. Beautiful necklace and just the right size. Many thanks. Super fast delivery and beautiful necklace! Very happy.